80% on road, 20% off road, which tires to choose? - Page 3 - THE PORTAL HUB - Pinzgauers, Haflingers, Volvo 303s and more! I've been running Yokohama Geolanders since I bought my truck - 7 yrs. now. They've been good tires on road, where most of my driving has (unfortunately) been done. I don't know the exact mileage, perhaps 10K, and they've still got some life left in 'em. BUT, I know that I've been in some off-road places where I was stopped by the tread, as it's not overly aggresssive. They're not the best off-road tires. I've already bought new Interco TSL SSRs which are awaiting installation soon. With the miles I put on each year (probably less than 1000), I'm more interested in off-road traction than tread-life. IMHO, on purpose built vehicles, tread life takes second place to performance. My other vehicle is an old Pantera. It runs Michelin Pilot SX or some such tires. I feel really lucky if they even see 3000 miles, and you don't even want to know what THEY cost. Just put on the new BFG KM2's. I have only had them on for a short period of time. I can only give you what i know so far. They are much quiter on road than my old BFG's and seem to handle a bit better. Off road they have worked well in the mudd, ok in the snow and great in the sand. I have noticed the sidewalls do not flex as much as the old ones which is good in some ways. I am thinking i will not be blowing beads as much at 20psi as I use too. As far as how long they are going to last? Who knows, I changed my old BFG's which had 25% tread left mainly becasue i didnt like running 5+ year old tires with alot of sun damage. I imagine these will make it to 5 years with mainly off roading and too and from trail travel just fine. I cant wait for Moab!!!! 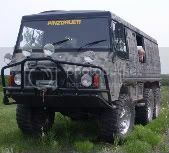 ITS NOT A F*&$%*# HUMMER!!!!!!!!!!! man on the mule. keep it real. I'm a little confused you like the trexus tires or not? And a 6" spear point as stone spear point? Only reason I ask is I have been told slip and slide on clay go with tsl just doing off road were the there are just sharp rock Trexus work fine. i think the trexus is a fine tire. the 6" spear point was a freek rock formation that would have got anything ive ever seen. it was really a 6" long by less than 1" diameter sharp pointed rock that when it went into the tire ,it broke off flush with the tread and held air till the next day when i went to work. i saw a "small " rock stuck in the tread and saw that the tire was a little low on air. i was really close to the discount tire place i usually deal at so went to them and.....like i said about tires and girls ,no one tire/girl is suited for everyone. i dont know about clay/bad mud as there isnt much of that around where i usually go.the trexus did fine in the snow last winter. the size can have as much bearing on success as anything. wide is great in my experiance for soft like sugar sand on the mexican beaches, but wide sure makes it hard to go between rocks on a trail carved in mountains by a quad. ive never found anything in my life that does everything great. trexus served me well . i got 11k and they had life left.i think i could get more miles if i kept the pressure higher, but if i did, the ride on the 18 plus miles of dirt every day would beat the trucks and me to death .unlike with my wife and other girls, i am free to try all kinds of tires and by the time i wear out a set its kind of fun to try a different kind.so far im really liking the bfg mt km2. good performance so far.between the 2 trucks(dodge 3/4 ton diesel towing etc. and the pinz ive putabout 16k on them and no complaints so far. 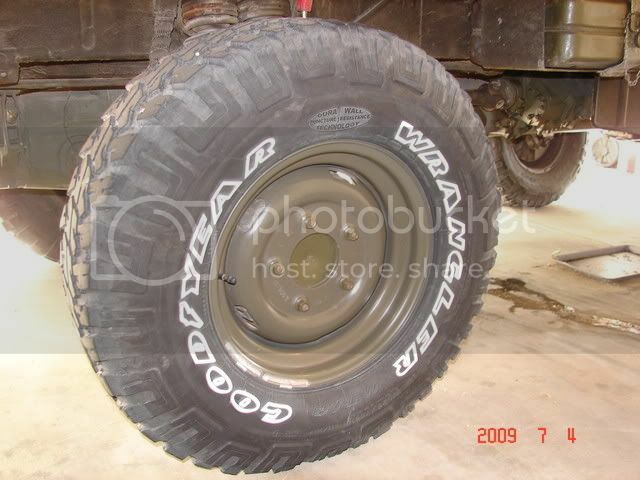 I have BFG MT 255/85 R16 KM tires and use them about 80 percent on road and 20 off. They work fine for me on highway and snow here in the Sierra Range. I drive some distances to get to SoCal so highway use is important to me. When I was at the Calico mogfest last year they worked fine on rocky drainages and in sand (20 psi). I haven't really done any serious mud but when I need traction the Lockers the Lockers do the job. My primary uses are heavy hauling and camping in remote areas, they seem to be just right for me. My only complaint is the amount of balance weights needed, I don't know if it is the rims or tires, so I've starting using the ceramic beads for balancing and they work great. I use Dyna beads for balancing media and I wouldnt go any other way - just make sure your stems are at the top when airing down!!!! NO MORE LEAD WEIGHT FOR ME!!!!!!!!! ABSOLUTSECURITY wrote: I use Dyna beads for balancing media and I wouldnt go any other way - just make sure your stems are at the top when airing down!!!! NO MORE LEAD WEIGHT FOR ME!!!!!!!!! I'm going this route too when I get new tires. I've heard nothing but good things about them. My last Jeep had GY MTR's. They were a nightmare to keep balanced. Nice thing about the balance media is that it is constatly readjusted and makes up for differences that take place on a daily basis - unlike lead weights. If you loose a chunck of rubber upon rotation the beads will go where they need to make the automatic adjustment! Couldnt get any more simple. ABSOLUTSECURITY wrote: Nice thing about the balance media is that it is constatly readjusted and makes up for differences that take place on a daily basis - unlike lead weights. If you loose a chunck of rubber upon rotation the beads will go where they need to make the automatic adjustment! Couldnt get any more simple. True.. but I have several friends who are now removing these. When airing up and down you have little control over the air quality going nto the tyre... so if there is a high moisture content (or worse, a hjigh oil content, from a crappy compressor) when you air up, the beads will have a tendency to settle and clump, rather than re-adjust like they're meant to. This situation is exacerbated on vehicles used infrequently. I havent had that problem - but then again I am in California and the air is really dry here - hmmm. I would figure out a way to control my air quality if I were them just to keep the outstanding benifits associated with the Dyna Beads!!!!!!!!!!! Their loss!!!!!!!!! I use these with balancing beads. Tires and beads work well for me both on and off road.